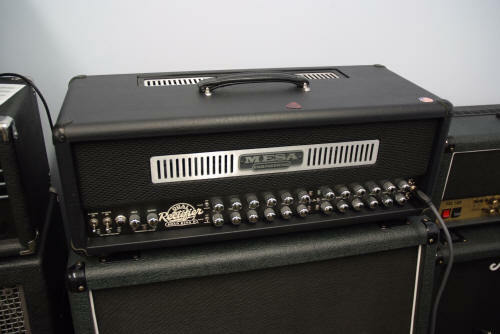 The Road King II is at the top of the Mesa Boogie Tree. See it in this special Road King II section. Here I discuss why it remains one of the best amps in the world today. The Mesa Boogie Road King II - as you have never seen it before! If you just watched the video where its reviewed then you can see right off that this amp really is different. I suspect that you cannot think of another amp from ANY manufacturer that offers all the features built right in to this Road King II. Check the specifications page. I used to have a Road King version 1 combo amp a number of years ago (new in 2004) but I never really achieved the sounds or performance that the amp should have been capable of. Whether it was the speakers, the settings or something else I don't know - and I never really got on with that amp for some reason - but I did not know then what I know now - and what I do know is that through experimentation with rectifier amps my sound changed until it got GOOD from a rectifier amp - any of them - they all have the exact same driving problems. I remember it cost me a small fortune, it was custom ordered and I waited weeks on end for that one. Within 9 months I had sold it. It wasn't that it was built badly, or that the features were not there ;they were; it's just that sometimes guitarists simply don't get on with a piece of equipment; it was like that for me with this amp. I lost a lot of money. But it was probably my own fault. Part of the idea of this website was to stop things like that happening to other guys, money is never easy to come by, but you really feel the pain when you lose so much of it on an amp that was played for less than three months and I really could not stand it. That amp at least to me at that time had one sound - a bad one! It was far too complex? Some or all of those things above might well have been the reasons. I just could not get a decent lead guitar sound from the Road King Version 1. I scanned the forums, asked around (very few guys had one of these in the UK and I'm not surprised it cost about $4995 or £2800 here in the UK when I bought it) for advice, and eventually gave up as a bad hope. But later I bought a triple rectifier which are not too easy to drive correctly for a great lead sound and had it rocking in no time really. Later I sold the triple, bought and sold another then bought a Road King II head. Now this thing is a completely different beast than the Road King Version 1 I had in 2004. This firstly is a head - so I can control which speakers to marry up to it (you could on the combo - but the combo weight alone made you not want to). Secondly - and more importantly, I had been down the road of TWO Triple Rectifiers over the course of about 4 years and gained much experience in driving those amps. To be honest, other than the obvious things - and there are many of those - this amp reminded me of the Triple Rectifiers channel two - particularly on channel 3 in vintage mode for lead guitar work. In fact to me it feels exactly like the same channel, same sound, same feel, but alas not the same price. But this amp has gone beyond all my expectations of the Road King II. I was not too enthusiastic about the Road King II after having the green monster version 1 above, but I thought that if it did not work for me then I could at least resell it and give up on the Road King II forever. There is, other than the obvious, little between this head and the original combo of old - I think it sounds better though. I would NEVER buy another combo - at ANY price and today if I had one it could put my back out of place - no thank you. When I say heavy, unless you have actually experienced moving a RK combo around, you have absolutely no idea what heavy means. There are two massive fold out handles - one for each person moving that combo - and you will not carry one yourself up those stairs to the gig. So, what's the secret of making one of these Road King II's do it for you and your audience? I hate to say it, but there isn't one really! This is just one hell of an amp that actually does it all - and then some. It's true you still have to use the right speakers and cabs and really KNOW how to drive a recto amp for the sounds you want (read the Road King II in use on this site) but they are all in there. I also have an Engl E670 which is also a world class amp. A great guitarist and a friend of mine (see him HERE) came around to the studio recently and we turned the Road King II and the Engl E670 on one at a time ust to compare them really. The Road King II went first and Graham Elks thought this amp was awesome - and I can tell you he should know - check his music out on the link above. However, I then turned on the mighty Engl E670 (like the one Orianthi used for the Michael Jackson concert that did not happen) and he was amazed that in his opinion the E670 was BETTER than the Road King II. It's a subjective thing when you compare amps like that and what's cool and does it for one guy the next person might well disagree. Think women! Personally I think each amp does not compete for the sound - each has it's own vibe and they are both at the top of amplifiers in the world in my view along with a few others we could name as the worlds best. In any case - if you want to check out the Engl E670 go to www.englamps.co.uk which is a website I wrote a few years ago all about the E670 and compared it with other amps - it's worth a visit. I have talked somewhat on the question of emulation of Tube amps (check the Triple Rectifier home page on this site). I will not repeat myself here too much but the more I think about that subject and the equipment out there that tries hard to emulate one tube amp sound, the more I realize that they have an almost insurmountable task. Mesa Boogie talks about 'Nothings more satisfying than a great old tube amp... except a fleet of great old tube amps' and although that phrase might just go in to one of your ears and out of the other - the truth is, that this description embodies the core of the matter regarding emulation. The Road King II is not an emulation - its the real deal - not 'old' maybe, but it really IS a whole conglomeration of tube amps rolled in to - wait for it - not one amp - but a whole pile of separate amps that have been crowbarred in to one chassis by Randall Smith. I daresay that was also the case with the Road King version 1, but it was still, in my view, being honed a little to perfection. With the Road King II you have in a REAL TUBE AMP what the axe-fx, eleven rack, roland GT series, Line 6 and many other manufacturers have been trying to emulate for years - the axe-fx being the nearest - until you turn off the effects - yuk. While they have emulations by the bucket load, there is no product on the market (like those mentioned here) that can actually come near to the Road King II because of the multiplicity of sounds that this amp can achieve - and the RK sounds are perfect - not clinical emulations masked by some great, but annoying effects just to make those emulations sound better. If you notice, they ALL have those effects turned on when you listen to them on YouTube or anywhere else for that matter. Its because the effects hide the true sound of the emulation. The Road King II follows the designs from Randall Smith since 1991 when the dual rectifier first saw the light of day and all of a sudden music changed. Imagine how profound that was? It was a point in the history of guitar amps, a little like Fender in the older times and just like Jim Marshall in the mid 60's. While the amp makers of today all have more technology at their disposal there's nothing new coming through right now. The tube amp market has everything we all know, but there is no product (I don't think) any time soon that will shake up the guitar tube amplifier industry like the rectifier series of amps did in the early 90's. Theres the Marshall AFD100 amp, but thats really a specialist amp designed for one use. Check the review of that coming soon when I get the amp. And there really are many more; just thinking about all the amps you REALLY can sound like is hard; if you try and name them all you could be working on that for some time. Then there's the flexibility of the speaker cab options. This amp can be set up so that any channel once you select it, can output to any of the TWO cabs you can use. So you can use an open back for some sounds and closed back for the other styles or sounds you want. One disappointing thing to note is that there is no midi control to speak of. 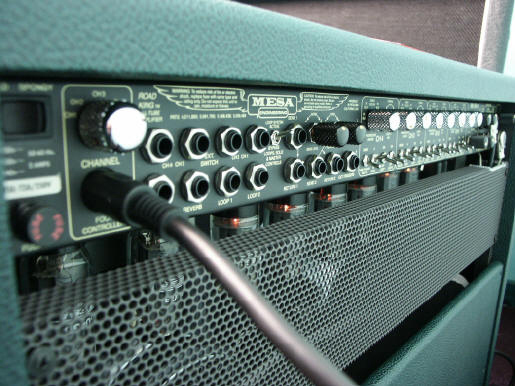 Mesa Boogie still insist in putting those hardware switches in the back of the amp instead of using midi to control the rig, I think that's a big shortcoming today. So the midi pedal becomes hard work - or rather the AMP does. There are other pieces of equipment you can use, but it's much more messy and a real pain - hey listen up mesa... a $20 cost is a price everyone would pay - and don't try and tell me it costs more than that - I've been there! That's it for now on this introduction page to the Road King II so check out the other sections of the website from the menu at the top of the page that relate to the Road King II; it should be interesting. Because I still have this amp I intend to take this section of the web much further than say the triple rectifier which I have now sold. It's a little harder to remember exactly how I did some of those setups now those amps are no longer here. But this one is rockin and a rollin so these pages are much more in depth and more recently I show you how to convert the Road King II from 110 volts to 240 volts.